The recession signal being sent by the bond market may be scary to some, but stock analysts caution that investors shouldn't act too hastily and there are still likely to be gains ahead even if a recession is on the horizon. 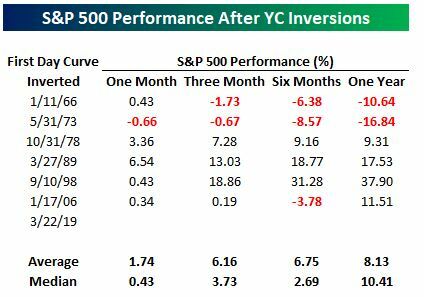 The so-called yield curve inversion often occurs well ahead of a recession, and in the last four inversions the market was higher every time with an average S&P 500 gain of at least 9 percent, according to Bespoke. After the curve inverts, the worst time for stocks is when it steepens again the Fed begins to cut interest rates. Canaccord Genuity also urges stock investors to watch for other signals, like trouble in credit markets, before turning defensive on stocks. Some investors may be freaked out over the recession signal being sent by bond market rates, but if history is a guide, there is still time to capture more gains in the stock market. The so-called 'yield curve inversion' where the yield, or interest rate, on shorter term Treasury instruments — in this case the 3-month — rises above a longer-dated Treasury yield, or that of the 10-year note, is a classic recession indicator that is often correct. As analysts say, there haven't been recessions without a curve inversion but on the other hand, not all curve inversions lead to recession. But Canaccord Genuity and some other firms point out, the stock market tends to react later, and the recession could also come two years or more into the future. "An inverted yield curve is not 'good,' but the 'bad' works with a significant lag," Canaccord analysts wrote. On Friday, the combination of the Fed's dovish forecast after its meeting Wednesday and weak German manufacturing data combined to drive the 10-year yield sharply lower to 2.41 percent. The 3-month yield was at about 2.45 percent, but not falling as much. Rates move opposite price, so bad news on the economy results in lower yields. The curve remained inverted Monday, with the 3-month at 2.45 percent, above the 10-year yield of 2.42 percent. Canaccord strategist Tony Dwyer said he believes investors should wait for trouble to bubble up in credit markets before taking on a sustainable defensive stock market position. Dwyer said the median gain in the S&P 500 from the initial inversion to cycle peak is 21 percent, with recession occurring a median 19 months after the initial inversion. In the last three most similar cycles, the S&P rose 34 percent and the recession was 25 months later. "You can see the median move to peak is 21 percent. It's 34 percent over the course of the last three cycles. Why would you get defensive now with the data showing what it's showing?" said Dwyer. Dwyer said over time, the moves between he 3-month and 10-year, and the more widely watched 2-year to 10-year spread are similar though the 2-year to 10-year spread is not yet inverted. The low-yield on the 10-year is eerily close to the fed funds rate, at about 2.40 and that has some market pros concerned, but Wedbush's Steve Massocca said the bond market phenomena could actually be different this time and be the result of extraordinary easing after the financial crisis that took many sovereign bond yields to negative levels. "I believe there continues to be overwhelming demand for US Government debt," he wrote in a note. "By far the US has the best or highest rates. This is versus many countries having zero or even negative rates, there is currently over $11 Trillion dollars of outstanding sovereign debt with negative yields! Regardless of economic perceptions be they good or in the case of Friday bad, the value inherent in US Government debt is creating exceptional demand." Massocca said the market move is being exacerbated by short positions hoping to benefit from a "normalization" of interest rates. "The German 10 year yield moved to a negative number on Friday and my bet is that was driven by short covering," he added. "Just looking at it, I don't think that by itself it's a major short-term concern. You have to see how things play out. There were some exceptions where you didn't see a recession, but typically you saw one in the next year or two," he said. Analysts also said they would watch to see if the move is sustained or just temporary. "If we start to see it steepen again right away, it could get ignored," said Hickey. "If we see it get further and further inverted, that would be something that would obviously be a cause for concern. We have a week left in the quarter and if we see earnings warnings from companies start to pick up that would be something to worry about." 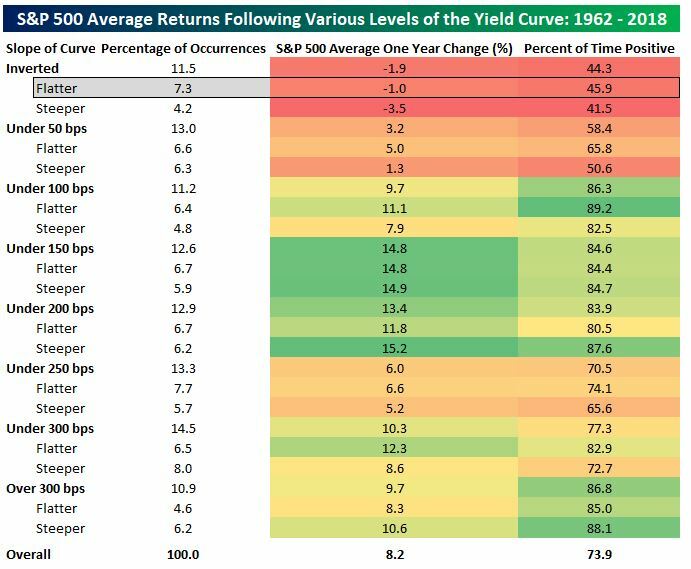 Hickey said market returns are often good when the curve first inverts, but it gets wobblier once the curve begins to steepen again. "It typically steepens because the Fed is cutting rates," he said. At that point, the short end rates fall with the fed funds rate. That's a big shift from just several months ago when rate hikes were expected it both years. The Fed now forecasts no more hikes this year, down from its previous forecast of three as recently as the fourth quarter. "As recession signals begin to flash, and recession probabilities increase, I would expect market participants and people who deploy capital will become more cautious and there's a risk that is a self-fulfilling prophecy," he said. "This is a Fed that has been quite dovish. They have shown they are willing to bet quite proactive, and they try to get ahead of things, and I would think this type of a Fed could very much be persuaded in that direction," he said.